For today’s work it Wednesday, I’m reviewing the Heat Tool. This ties in beautifully with another one of my swaps for OnStage. The Heat Tool is $30. It melts embossing powder and Heat & Stick Powder. The Stampin Up Heat Tool is slim, sleek, quiet, and easy to hold. It has 2 heat settings: low for drying ink, high for heat-setting powder. It also has a protective plastic tip to cover the hot metal end. The Heat Tool is must-have item for any card maker. If you have any desire to heat emboss, you’ve got to have this tool. You cannot heat emboss using a hair dryer. A hair dryer will just blow your embossing powder all over the place. The Heat Tool heats the embossing powder without blowing it. The hot air coming out of the Heat Tool is very hot. This is not a tool for young crafters to use on their own. I also use my Heat Tool to speed dry projects – both ink and paint. The card I made for my swap uses the emboss resist technique. 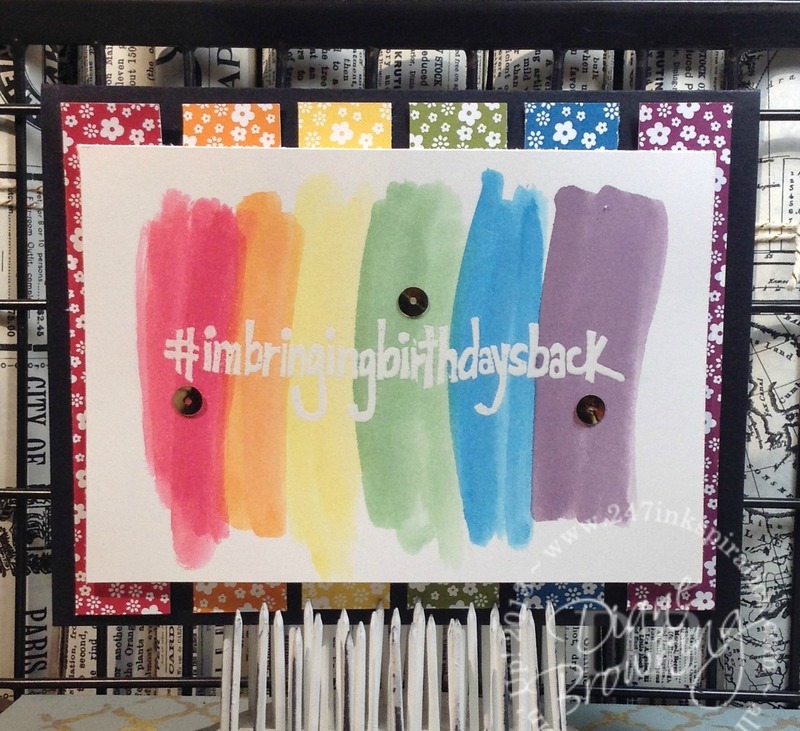 Using the #imbringingbirthdaysback stamp, I stamped it in Versamark and then poured clear embossing powder over the top. Versamark makes the embossing powder stick to the cardstock. Then I used the Heat Tool to melt the embossing powder. Once I had everything embossed, I used my aquapainter to do the multicolor stripes across the front. I found the easiest way to do multiples of this type of card is to lay out all my card fronts across my desk. I start with the color in the middle (yellow, in this case) and do all my yellow stripes first. Clean my aqua painter. Then do the color to the left, doing all the card fronts at once. Clean my aquapainter and then the color to the left of that. Then I work on the stripes going right. Starting in the middle allows me to give a more even stripe for each color and not running out at the far end or having too much space left over. And by doing all the same color stripes at once, I save time not having to clean my aqua painter in between each stripe on each card. Once I’ve done all the stripes, I let it sit for a couple hours to allow drying. After the card fronts are dry, I rub a tissue across where I embossed it and then the image pops out. I added strips of the Brights DSP onto the black card base and then mounted the card front on top. Using my Fine Tip Glue Pen, I added very small dots randomly across the fronts and then added the gold sequins. I do pull them one by one off the gold sequin trim. Check back Friday for my third and final swap that I’m taking to OnStage.